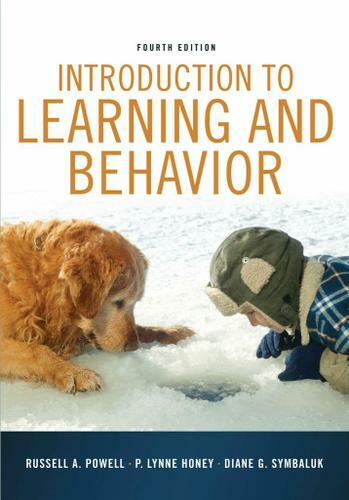 Powell, Russell A.; Honey, P. Lynne; Symbaluk, Diane G.
Offering a variety of innovative teaching tools, INTRODUCTION TO LEARNING AND BEHAVIOR, 4e equips students with a clear introduction to the basic principles of learning and behavior. Designed to apply learning theory and principles to the presentation of learning, it vividly illustrates how learning principles work in both animals and people. Throughout the book, the authors clearly demonstrate how the study of learning helps solve practical problems, such as improving study skills, improving relationships, raising children, and effectively stopping smoking. It reflects the latest research from the field and includes an all-new chapter on Comparative Cognition. Helping students maximize their understanding and retention of key concepts, the authors include numerous opportunities for review and self-testing. In addition, the text includes the widely popular SNIFFY THE VIRTUAL RAT LITE CD-ROM, which simulates a wide range of learning phenomena.